>Where have all the five star pictures gone? Six months ago I read a blogger’s opinion on contemporary films, stating that a particular David Lynch film was the only good film produced in the current decade and how cinema these days is boring to death. I thought it was a very radical opinion and contested it, as I think films these days can be as good and as creative as any other decade. Although I still disagree with opinions that underestimate today’s cinema, I’d have to agree it’s not that easy to leave the theater genuinely impressed by something. I could use my fingers to count the films that in the last five years remained in my memory, and if I had to diminish the number of years (let’s say 2004-2006), perhaps I could remember 3 or 4 films as being the best ones I had seen in those years. What’s going on? Is it something wrong with the movies or with me? I’d not say that’s something wrong with me or anyone, but one thing is certain: “We don’t see things as they are, but as we are”. I’ve seen thousands of films in over 10 years. At the time I fell in love with cinema (around the age of 11), I wasn’t as hard to be pleased. Many films I got to see at home because I was simply not old enough to go to the theaters. However, I saw many “free” censored films that I liked in the dark room, moments that were never forgotten. At the age of 10 I saw Batman Returns in the movies and I didn’t forget that dark atmosphere for days. 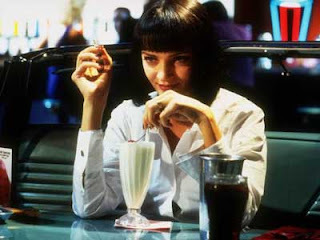 Two years later I rented Pulp Fiction and I will never forget how me and my three-years-younger-than-me brother laughed histerically at the moment Uma Thurman‘s character wakes up from her OD. And of course there were the sad ending romances, and the cinema to dream and to escape, as well as the epics. I suppose all my genre and style film preferences were built up at my early cinephile times, as well as my favourite actors. Tim Burton and Quentin Tarantino were two of my first big movie crushes. Around the same time I saw Heavenly Creatures and I would never erase Kate Winslet from the top of the best actresses alive. 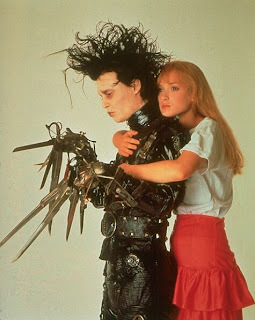 And those afternoon sessions replaying Edward Scissorhands from now and then. Johnny, Oh sweet and talented Johnny. I wonder if it’s ever going to be another Burton film that will top that one. Sweeney Todd? Hell, no. I actually liked the film, a lot more than I liked Michael Clayton, for example (I just haven’t been able to see that much Oscar-nominated films so far), but that’s something lacking in it, something I can’t even explain what. I love its opening with the camera penetrating each dirty spot of that surrealistic gothic and dirty London in rapid flashes, the cinematography is brilliant, and so are the art direction and the costumes created by the long-time Burton collaborator Colleen Atwood (watch an interview with her on the film here). Depp is scary like I’ve never seen him before, and I like his singing, especially in My Friends and Epiphany, and Helena Bonham Carter as his leading lady is equally good and deserved more attention. The supporting team was not quite impressive, except for a very happy surprise, the young actor Ed Sanders. And I guess that’s it. It’s a good film. Charlie Wilson’s War. I’m not really sure what to think of it. As a comedy is not very funny, except for the Philip Seymour Hoffman moments, and as a political flick, it’s very hard to take it seriously. Maybe, it was meant to be something in between? The film begins with Tom Hanks in a jacuzzi in the company of two strippers and a playmate surrounded by junkies and white powder, though he’s actually interested on what’s on TV, that shows the fight between Afghanistan and the Soviet Union. Settled during the cold war times, it’s Hanks and Julia Roberts going all the way to the war zone to defeat the red menace. It actually sounds interesting, but I didn’t think it was after seeing it, especially after the moral lesson in politics around the end, told through a very obvious metaphor. I miss Tom Hanks from Forrest Gump times. I never get sick of watching him in it. As for Julia Roberts, I just can’t stand her anymore. She aged, had twins, injected botox on her face and decided to deceive herself saying that not smiling anymore means great acting. Cassandra’s Dream. It could have been another Match Point, but it wasn’t. I’d rather see another Scoop, another typical Allen neat comedy every year, than seeing a nearly disposable Dostoevsky drama. The best thing in this film is Colin Farrell‘s acting, and I never thought I would ever write quite a sentence in my life. Match Point was a masterpiece, it deserved all the awards it could possibly run for, but I believe Cassandra’s dream was made through lazy hands. Ambition, irony and a not so easily expected twist are back in this second Woody Allen moral tale, that lacks the brilliance of the previous one. And then… Things We Lost in the Fire. A woman is all alone. It’s easy to understand her pain and despair, played by Halle Berry in her best performance since she won the Oscar. Right after seeing it, I really liked this film, but a week later, I realized I hadn’t liked it that much. Perhaps it has to do with how Susanne Bier insists to state in every single frame that this is a Susanne Bier film and she’s not kneeling to Hollywood. Eyes close-ups, ears close-ups, close-ups here, close-ups there. Accept the good. The things they lost in the fire and tears in my husband’s eyes, not in mine. Small things like that. This is not a bad film, but it’s not a great one, though. However, I liked it more than I expected. All these films were directed by very talented filmmakers and they were ok. I’m not bashing any of them. I’d recommend each not for the film itself, but for particular aspects in each of them. 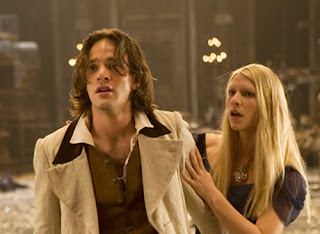 But if you really wanna stay away from something, don’t bother seeing El Orfanato and don’t dare to rent Stardust. Have you ever heard of Romance & Cigarettes? It’s dreadful, only worth it for Kate Winslet and NOTHING else. And Morvern Callar? Boring and pretentious, just like another one I saw in the movies recently, the same boring long walks, just that this time it’s a young woman instead of a brainless male teen. At times like these, it makes me relieved to know there’s always something fresh and new around the corner, something hard to be found in movie theaters and blockbusters. There’s always pearls to be discovered, I just feel sorry that many of them are not discovered in the darkness of a cinema theater.